The Swedish pavilion at this year’s Design Shanghai was called “This is Sweden at work”. It offered a glance into the future of office design, showcasing inspiring spaces that allow both ideas and people to grow. With office solutions that are stylish yet ergonomic, environmentally friendly and healthy, the Swedish companies represented at the pavilion truly illustrated creativity and innovative thinking through their products at display. Swedish interior design and construction company Muraya, together with the Consulate General of Sweden, created the workplace pavilion. 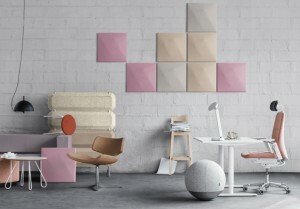 Six different Swedish companies displayed stylish and functional office design solutions. The featured companies were Kinnarps, Blurair, Green Fortune, Aim, WallVision and Dux. Swedish design is characterized by clean lines, elegance and functionality. The workplace environment plays an important role for innovation and for providing the right atmosphere for creative and healthy employees. The pavilion saw Swedish designers create pleasant office spaces with an air of professionalism for the company.